Pinch Me | What's in a Journey. Seriously, somebody pinch me because I’m dreaming. That or I’m such in a jet lag induced haze after 20 hours with no sleep. The later is probably the most true. I am currently sitting in the rooftop cafe o my hostel, letting the breeze from the Sea of Marmara wash over me and take away the sticky feeling from the humidity. 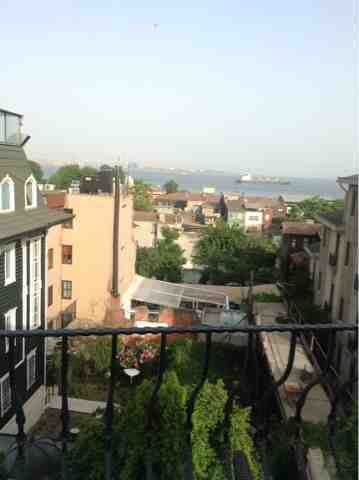 From the rooftop where I sit, I can see the Bosphorus and across it, Asian Istanbul. I’m suddenly very aware of how large the Bosphorus is and wonder how on earth the old caique (boats) ever made it across in even semi-bad weather (they did not run during real storms from what I understand). The Willamette River holds nothing on the Bosphorus. If I were to move to another spot on the rooftop here, I would be able to see the highest dome and minarets of The Hagia Sophia Mosque. Earlier when walking around with my new friend (more on that later), I heard the Call to Prayer and suddenly felt like a “decadent Westerner” (If you watch “Little Mosque on the Prairie,” then you will understand the humor here). It wasn’t nearly as loud as I thought it would be. I was hoping it would knock me off my feet, that way I would be certain to hear it from my hostel and it would wake me early enough for embracing whatever the day held. Back to the new friend. I was initially told that I would have my 4-bed dorm to myself tonight, so I was a bit surprised after my shower to find another girl had moved in. I am not certain yet if the Proprietor is entirely trustworthy, but it’s hardly a major transgression. In fact, it’s kind of great, the girl turns out to be another lone traveller (from Australia). She had already walked around the city a bit, so I followed her up to the area of the Blue Mosque and Hagia Sophia where we found dinner and dessert and just visited. We parted after that so I could take a short nap (still not certain if that was a good idea, I feel more groggy now). It was nice to just have another person to sit down with for a while anyways, we’ll see how much we do together. Once again I’m feeling non-commital. Tomorrow, I think I will start my day at Topkapi Palace followed by the Archaeology Museum. I’d like to stop by the Caferaga Medresesi (an art school nearby) to check on their schedule for Turkish marbling (Ebru) classes. I’m also meeting a friend for dinner, she teaches English here. Here’s to a slow, but excellent start to an amazing adventure! See Asia there across the river?! Keep it slow, you know how quickly it will be over! Looking forward to lots more posts, love your view. Meanwhile, back on the ranch (not! ), I'm inside with a heavy sweater on and it is pouring. Believe it or now, there are flood warnings for our area today! LOVE YOU! Gorgeous, just like you! Enjoy–I'm looking forward to soaking it all up vicariously! Thank for keeping us up to date, really enjoying it. Like your Mom stated really take time and enjoy. Enjoy your time there, and keep the blog entries coming! I am jealous of your trip, and can't wait to hear about the places you are planning to go! Will you travel further afield than Istambul? If you get a chance, check out the Valens Aquaduct. And – for the fun of it, keep telling everyone you're in Constantinople and pretend the date is 1913. I am sure nothing would go wrong! Have fun! Be safe! I can't wait to see the pictures! Squeee! I was somehow (translate: in a postgrad school haze) unaware that you were already on your trip– I even texted you a few days ago, because I was worried about when you were leaving, etc — until Jim told me tonight that you had linked to your blog on G+ (which I never check!) So now I am reading, from the beginning, and am so excited!